hochschule – How to Shape Human Behavior. 00:00:25 Executives play a critical role in the corporation, however critical they are varies from company to company. In some company structures, executive decisions are made and those decisions are acted out religiously, whereas in other companies, executive decisions act as starting points for discussions within the company. Regardless, change only works when there is ‘across-the-board’ committment on the executive board level. 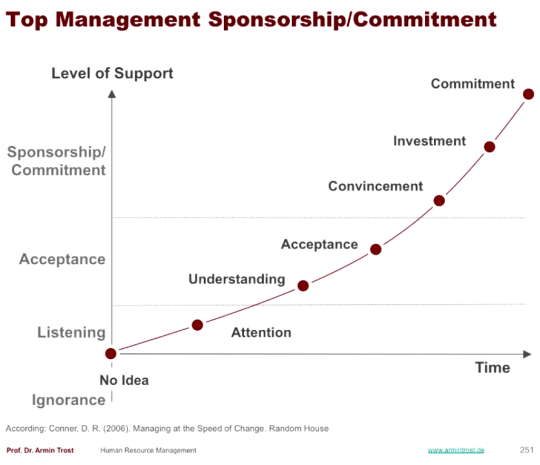 Top management sponsorship refers to the point at which executives not only agree and are convinced that an idea or decision should be made, but actively unite behind the idea and actively push for it to be implemented. No idea: Not listening, ignoring the speaker and/or checking his or her email while the speaker presents the idea. Attention: Listening but not understanding either the idea or the gravity of the idea. Feigning a positive reaction to the idea. Acceptance: Acknowledging the idea and saying “You’re right, we should implement it,” thus investing in the idea, but then leaving the meeting without committing any further support. Investment: The difference between accepting something and investing in something is the presence of an active acceptance towards the idea, for example investing money and time, and not only saying “We’ll look into it,” but actually meaning those words. From this point on, in every persuasive position you find yourself in you must be able to distinguish where on this graph your argument for or against an idea lies, and then act accordingly. Once the executives have reached “commitment” level, change agents – or brand ambassadors – are needed at every level and in every country within the organization to follow through in their respetive areas. The overall sponsor above the ‘steering group’ may be the CEO who decides on the budget for the idea’s entire project; the one who ultimately wanted this change to happen. When dealing with influencial opponents of a change strategy, put that person in charge of the steering committee or in another leadership role; make that person responsible for the success of the project. Once that person is responsible for the project’s success, even though he or she is against it, you’re in a better position. This is politics. 00:13:29 During change management, external consulting teams are there because of their expertise. They have helped so many other organizations undergo change management that they instinctively know how to implement it; companies are essentially renting intelligence and experience for a limited period of time. 00:15:41 During change management, it’s important to have a sounding board: a designated group of people who oversee the project, provide feedback, and point out the concerns to address. 00:20:01 Should you immediately and transparently begin communicating about the impending change, or should you wait until the last minute? This answer depends on many factors such as your company culture, the type of change being conducted, the type of industry you’re in, how the news will/could affect the market and your share price, and how competitors might react to this change. A downside to communicating early on is that rumors can get started which can quickly derail the project and confuse the employees involved. Consequently, the downside of communicating late can also have the same adverse effects of confusion and distrust. Point is, you can expect to have problems regardless of when you communicate. Corporate communication is very difficult and a lot of things can be done wrong; Once things have been said, they cannot be unsaid. Corporate communication is an art.